Despite years of intense medical research, the cause of Alzheimer’s remains enigmatic. The ultimate molecular manifestation of the disease consists of the accumulation of a small toxic protein called amyloid beta that causes inflammation and destroys neurons. Why this occurs in some individuals but not others is unknown. Genetic, immunological, and environmental risk factors have been investigated, but no smoking gun has emerged. 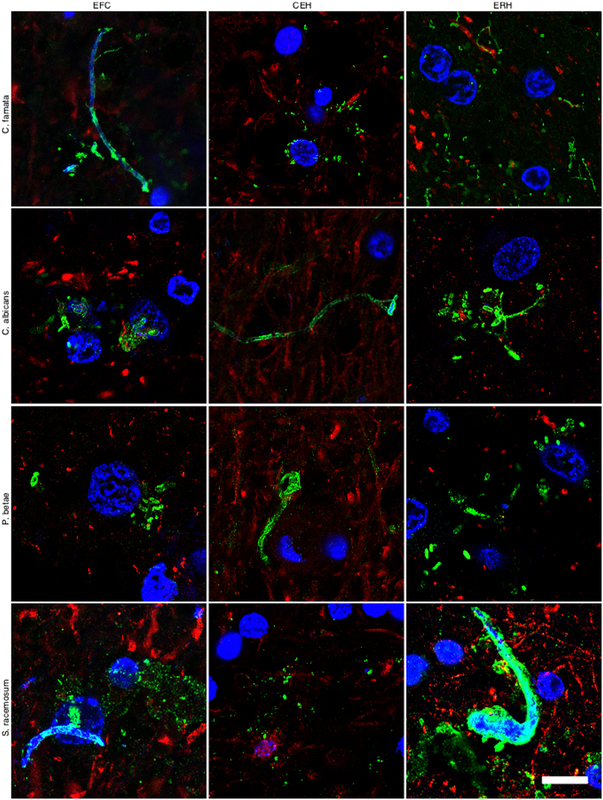 In the figure above, the authors stained (in green) various regions of an Alzheimer’s brain with antibodies against four fungi: Candida famata, Candida albicans, Phoma betae, and Syncephalastrum racemosum. All samples were positive. The authors then performed PCR, a test that detects DNA, on ten additional brains with Alzheimer’s. All contained fungi, while control (disease-free) brains did not. 1. Is fungal infection a cause or consequence of Alzheimer’s? It is possible, if not likely, that people with Alzheimer’s disease are so sick that their brains become susceptible to fungal infection. Under this scenario, fungus would be a consequence, not a cause, of Alzheimer’s. 2. Why are so many different fungi present in the brains of Alzheimer’s patients? Altogether, the researchers detected 10 different types of fungus. From an infectious disease standpoint, it is unlikely that so many different fungi are acting as pathogens. While it is certainly possible that a toxic cocktail of fungi triggers Alzheimer’s, this result is more suggestive of an opportunistic infection (i.e., a microbe taking advantage of an unhealthy host). 3. How do fungi cause the build-up of toxic amyloid beta proteins? This question was posed in an email to RealClearScience by epidemiologist and Alzheimer’s disease expert Walter Kukull of the University of Washington. Before fungus can be declared the cause of Alzheimer’s, it must be shown how it is to blame for the molecular manifestation of the disease. 4. Do antifungal agents cure or block the progression of Alzheimer’s? The authors correctly note that clinical trials using antifungal agents will be necessary to test their hypothesis. The authors, therefore, have opened a very intriguing new line of investigation for Alzheimer’s researchers. However, it is still far too early to pop the cork on the champagne bottles.